So much for plans; ours got dashed by both whim and weather in no time at all. Guess that was a wrong turn! We had a lovely ride from Bad Ems, finishing up the Lahn River in the aptly named town of Lahnstein. A short distance up the Rhine from there is Koblenz, where we landed a hotel with a sweet riverside view. Perfect! 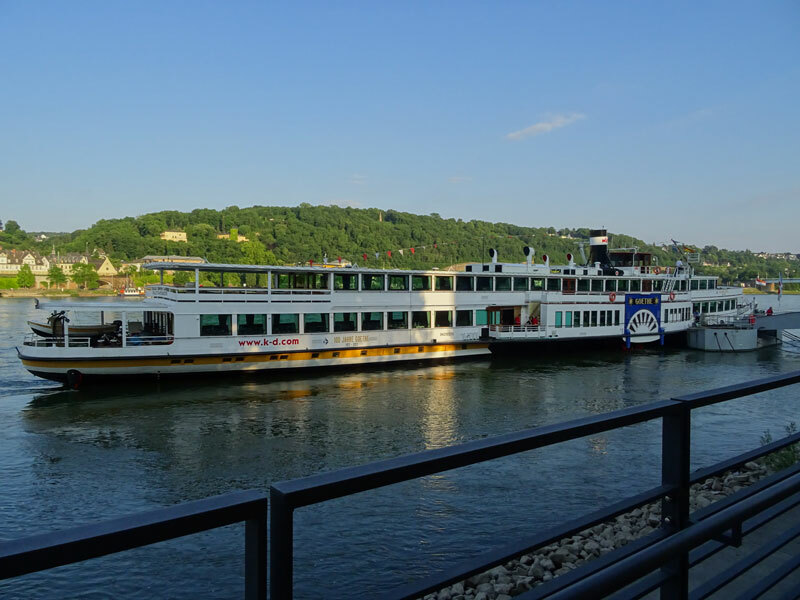 And there, parked right in front of our hotel, was a KD Rhine River day cruising boat. Now, I’ve been aching to see the Rhine Gorge by boat. As they say, Carpe Diem! … and so we did. 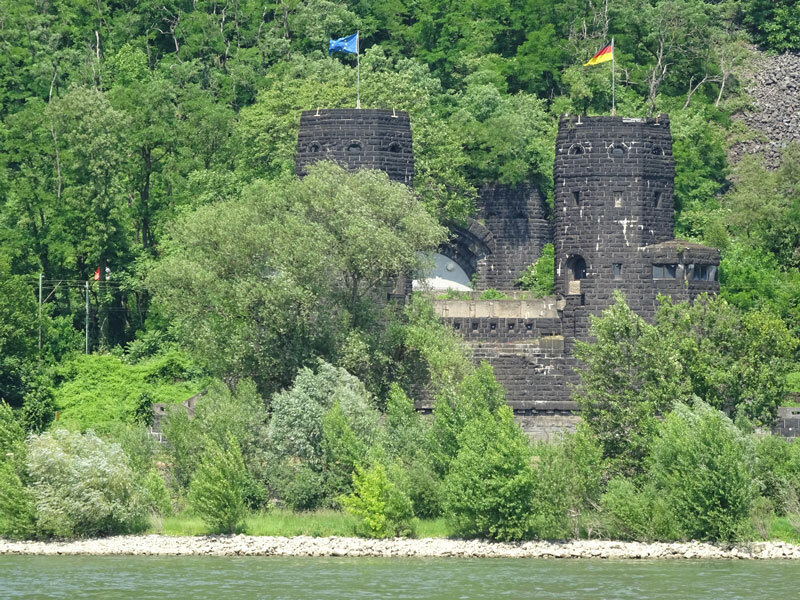 We arranged to spend a 2nd night in Koblenz, and spent a full day cruising up and down the Rhine gorge. The Rhine is a fast moving river. 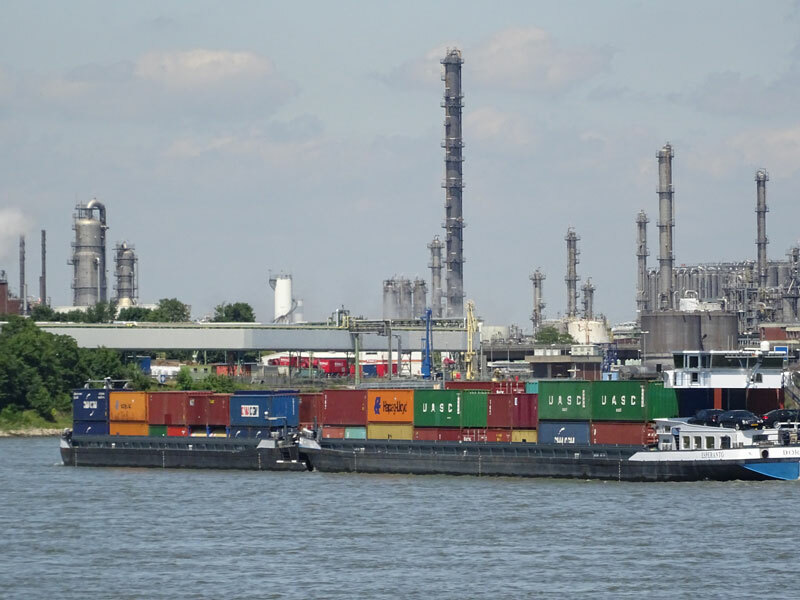 From Koblenz to Rüdesheim upstream takes over 6 hours, the return downstream trip takes just 4. It was beautiful, scenic and wonderfully peaceful; quieter than the bike path which runs alongside a busy road much of the way. We have now most definitely seen the Rhine Gorge, twice by boat and once by bike. I think I’ve finally gotten my fill of it. 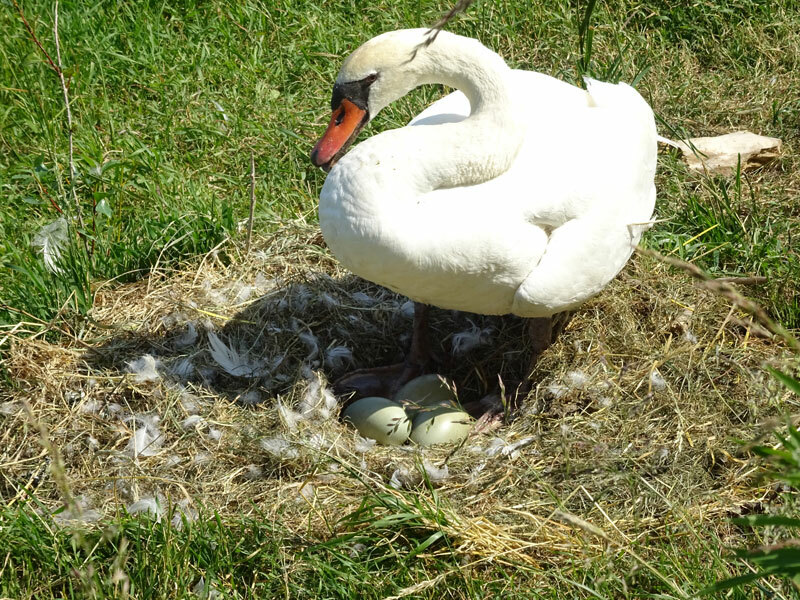 Swan eggs … right by the side of the path! Koblenz is nice; another lively university town, with plenty of tourists, but by no means driven by tourism. I could have spent more time there, but that’s not our style. Onward it is. 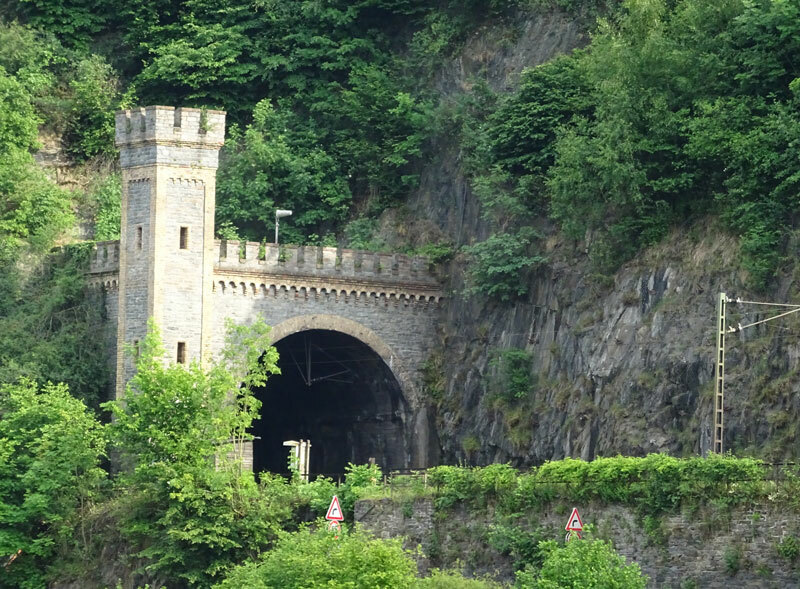 For those of you who saw the movie, “The Bridge at Remagen” — One of the two remaining bridge towers. The Rhine valley becomes more congested as it continues north. Just looking at the map is a bit frightening. It’s one large city after the next. Surprisingly, the ride from Koblenz was pretty nice. There was some industry and traffic, but much of it was quiet and scenic. 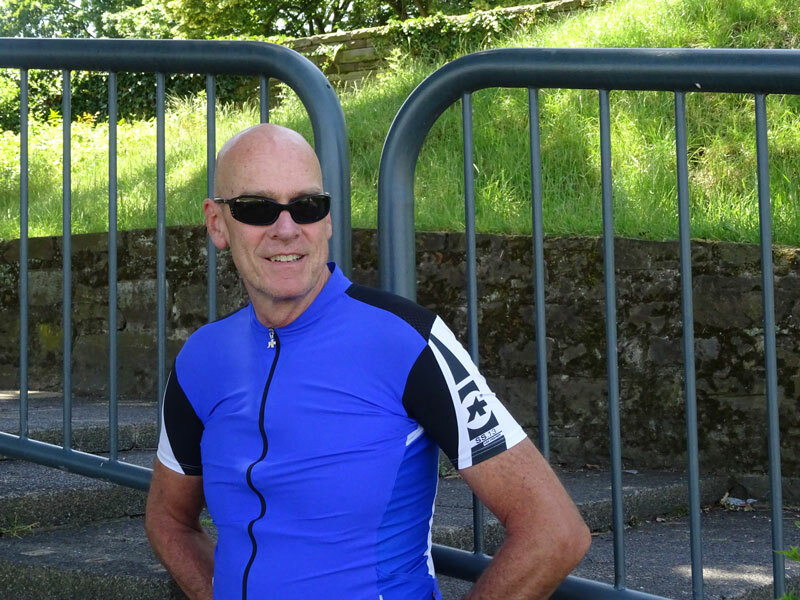 It was hot, very hot … which made for tough riding. And Jeff got bitten by a cranky Jack Russell terrier. It broke his skin and hurt, but I think he was more insulted than anything else. For the rest of the ride, he would periodically blurt out “He bit me!” Almost in disbelief that any dog wouldn’t recognize him for the dog lover that he is. Perhaps it was a language problem. No sooner did we check into our hotel in Bonn, than the sky opened up – lightning, thunder, rain coming down in sheets. I imagined us cycling on an open path without shelter and thanked our lucky stars. It continued raining the next day, so we got another forced rest day. That’s okay; these old achy bones could use it. Yesterday was the half way mark; one month down, one to go. 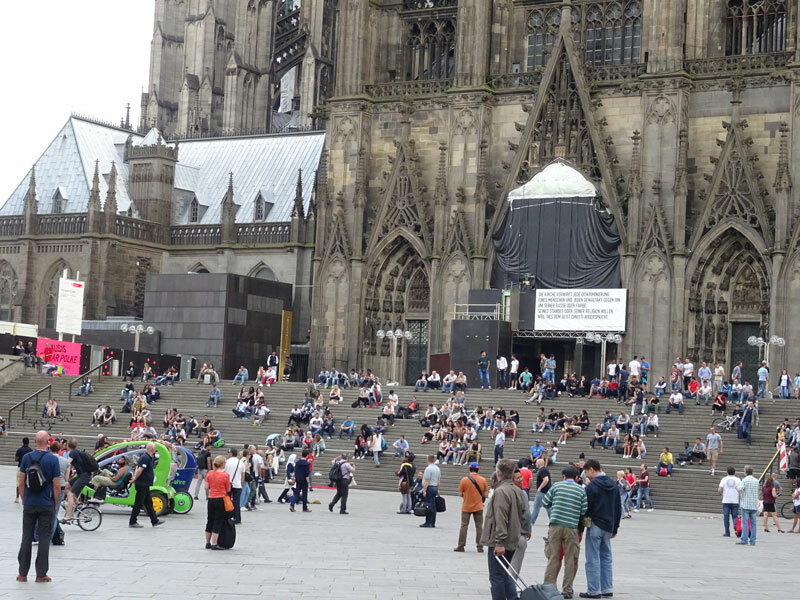 After a relaxing day in Bonn, we took a short 38k ride to Cologne, or Köln, as it’s spelled in Germany. Köln is a big city — over a million people, half of whom were on the otherwise lovely riverside bike route as we entered the city. It was harrowing! Jeff navigated the throngs of bicycles, skaters, kamikaze children and Sunday strollers with aplomb, but I nevertheless had a tight chest the whole way in. I’m sure there are lovely sections of Köln, but we never got out of the gritty area around the train station and cathedral. The enormous gothic cathedral is one of the few large buildings that didn’t sustain significant damage in the war. Apparently, it was so large that it was used it as reference point during raids. We were fortunate to go through it at a quiet time. It gets, on average, an astonishing 20,000 visitors a day! 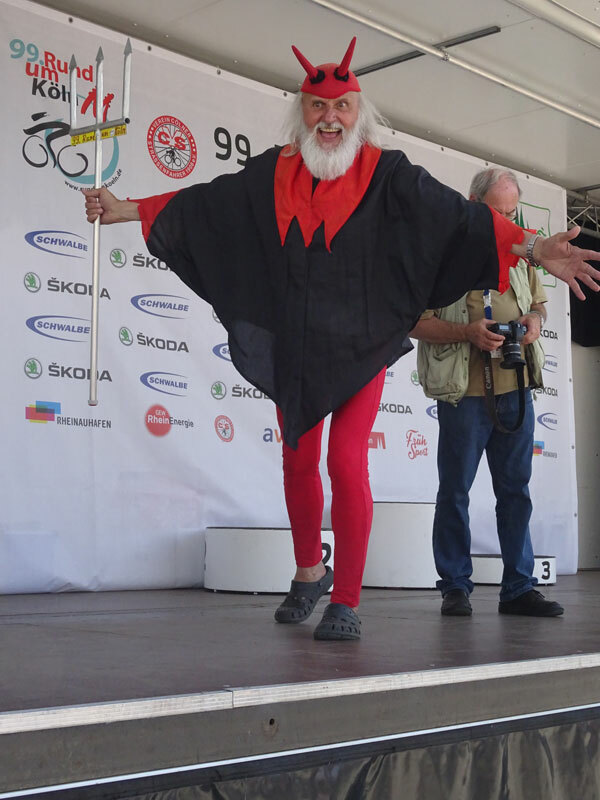 For bike racing enthusiasts; the infamous devil, who made an appearance at a bike race in Cologne. Today we take a train to Essen, where Jeff will have his chemotherapy tomorrow morning. We just don’t have the heart for more cycling in this congestion.